Today's hike was about a magical white landscape contrasting with an endless blue sky. On Thursday night it started raining, then froze, and then snowed overnight, so that Friday morning we had to shovel out about 7" of very heavy snow. Friday night and on and off all day Saturday it snowed about another 10", though lighter and fluffier, so we ended up shoveling a couple times more on Saturday. We have a fairly steep and long driveway (about 150 yards), so we ended up feeling pretty sore by the time we fell into bed last night. When we woke up in the morning, it was foggy and gray, so we figured it would be a good day to hang out inside and rest our aching muscles. But then the sun broke through and we had no choice but to grab our packs, pull on our gaiters, and head for the hills. From the moment we stepped out the door, we were in an enchanted wonderland. 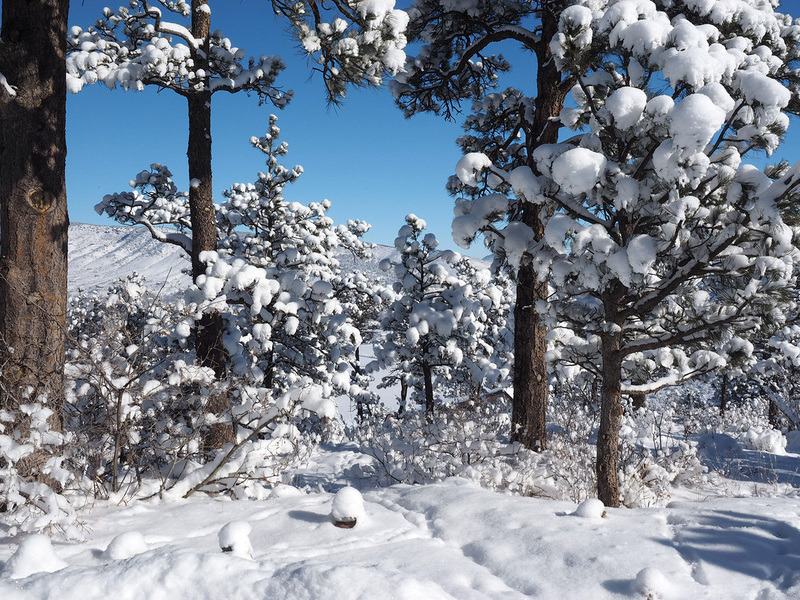 We went over to the nearby Hall Ranch, where the snow had transformed everything, and hiked up the Nighthawk Trail.